It has been an eventful week with the release of Early Access on Tuesday for the Shadow of Revan expansion. I have been able to enjoy some of the Early Access content. There has been a lot to take in; from new story content, new planets, lore, NPCs, all the way through the new Discipline system. The expansion adds a lot to this game, and like any new updates, there will be glitches and yes, there are a few. Thus far, all and all this expansion seems to be really good. Episode 133: Go for Expansion! Join Jason and Heather as they share their experiences in SWTOR. We discuss the last SWTOR Twitch stream concerning changes for Smuggler/Agent in the new expansion. Have you seen the latest Revan trailer? If not, be sure to look inside for this video. Heather and I discuss some of the images found in the video and what we are excited for as Shadow of Revan expansion goes live! Hello SWTOR Community! Yes, this week’s HoloNet Links is coming to you earlier. This Thursday is Thanksgiving for those of us in the United States of America. That being the case I’m getting the article posted early to enjoy the holiday with my family. Not only is “turkey time,” but the expansion will be out in less than five days for Early Access! How excited are you for the arrival of the Shadow of Revan? Join Jason and Heather as they share their experiences in SWTOR. This episode we are joined by fellow SWTOR Community member SWTORista. She and Heather both were in attendance at the EA Press Event 2014 for Shadow of Revan. Besides learning how the event went, we also have the Q&A recorded in its entirety. Sit back and enjoy this special episode! As I started to write this week’s article, I realized in less than a week Thanksgiving will be celebrated here in the United Sates and the following day starts the shopping madness. Is it possible to have time pass so quickly that it seems almost part of a dream? Well, fast or not, the benefits of being with friends and family during the holidays outweigh the loss of time. 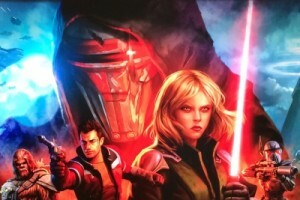 Besides the quicker it passes, the sooner we will get to play the new expansion – Shadow of Revan.